﻿ Le Nomade Hostel & Cafe, Kuching | FROM $5 - SAVE ON AGODA! Have a question for Le Nomade Hostel & Cafe? "The staffs are quite friendly also." "Loved the privacy and extra security of the gates installed." "Perfect location, located at the center of the town area"
Well-positioned in Kuching City Center, Le Nomade Hostel & Cafe is the ideal point of departure for your excursions in Kuching. From here, guests can enjoy easy access to all that the lively city has to offer. For those of you who want to venture out, Unika Borneo Art & Artifacts, Tua Pek Kong, Hong San Temple are just some of the attractions available to visitors. Take advantage of a wealth of unrivaled services and amenities at this Kuching hotel. Free Wi-Fi in all rooms, 24-hour security, daily housekeeping, 24-hour front desk, express check-in/check-out are just a few of the facilities that set Le Nomade Hostel & Cafe apart from other hotels in the city. Experience high quality room facilities during your stay here. Some rooms include television LCD/plasma screen, additional bathroom, additional toilet, clothes rack, complimentary instant coffee, provided to help guests recharge after a long day. The complete list of recreational facilities is available at the hotel, including dart board, garden, games room. Le Nomade Hostel & Cafe is a smart choice for travelers to Kuching, offering a relaxed and hassle-free stay every time. "Good, friendly atmosphere, well maintained and welcoming." Really love the theme of the place, very unique and gives the place its distinct character. Loved the privacy and extra security of the gates installed. Location and view may not really be up to par (for me) but it's not hard to find. Plus it's near the bars and eateries. Facilities are basic but enough for me. Worth the money for a night's stay. Wouldn't mind going there again. Lovely and cozy, the hostel is centrally-located. Walking distance to Jalan Padungan and the Kuching Waterfront. We were fortunate to have booked the last double room with windows on the top floor. Security is good as the hostel uses access cards. Breakfast was simple - sausages, eggs, jam, peanut butter and there is coffee making facilities. Bathroom needs some improvement: Sink - strainer & drainpipe need replacement. Floor strainer needs to be cleared of hair & dirt. For the shower, the low water pressure can't be helped. The staff is always the stars. Mimi and Ash (I hope I got his name right) were lovely and friendly who made us feel at home. Thanks, guys! 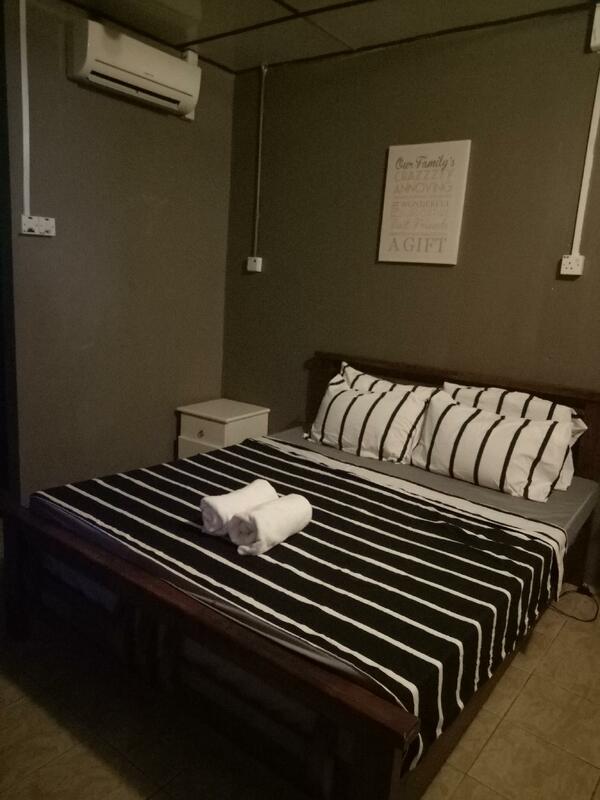 small hostel with two rooms，nearby city central，kind stuff，but the room with strength smell. Cosy, good atmosphere. There weren't many guests when we stayed there so it was quiet. OK WiFi, will disconnect or be slow every now and then. Simple breakfast but very nice (the jams are delicious!) Staff is just ok.
For over 4 weeks this has been the hostel I returned to after making trips. It has a relaxed atmosphere and the staff are very nice and helpfull. The dorm is very spacious, can definitely recommend them: you get excellent value for your money! The entire place is clean and the laundry service is just excellent as well: washed & dried clothes within 4 hrs for the standard price per kg in the Kuching area. The location is near the waterfront, the carpenter street and just perfectly located in Kuching. Beneath is a cafe with good pizza's and nice atmosphere. The best value for your money and to have a relaxed stay in Kuching! Definitely recommend Le Nomade!! Very good location w easy access to city Centre & those popular streets. Friendly & helpful staff. Washroom & bathroom is always clean (which is v important for me).. Nice & Cosy little 'lobby' to relax. It's just like what you've seen in the picture. I would say it is a very suitable place for the backpackers/ tourists who wish to get to know more friends from different countries. The staffs are quite friendly also. For me personally, I would say cleanliness is the most important, Le Nomade is clean and neat, I like it a lot. Overall, if you're looking for a place to sleep, and to meet new friends, I would recommend Le Nomade. Pro: very social place, met great people there, staff speaks good English and is very helpful, I was in a single room without window Cons: dark single room, no window, no air con!! !, the shower did not work in two floors, only one shower for the whole hostel was working, for me a reason to leave the place, because this one was next to the kitchen and the common area! Common area as always in Asia too cold, sometimes no toilet paper and also no lock to close the toilet ... I was glad to leave! For our stay we took basic double room which appeared to be on third floor. This was big disappointment ... Floor in corridor on 3rd floor was dirty and not cleaned at all while our 4 days stay (same stain welcomed me each day). It is unacceptable as you are requested to leave your shoes on staircase and walk without shoes all time. Seems it used to be nice hostel but it great years passed already. Due to staff approach would recommend other place. Good: Great, friendly receptionist. Accessible. Walking distance to waterfront. Quiet. Can be improved: Though it's a hostel, the premium room should at least have a tv.